Dr. Angello is board certified by the American Board of Pediatrics, and is an attending physician at Lawrence Hospital Center. 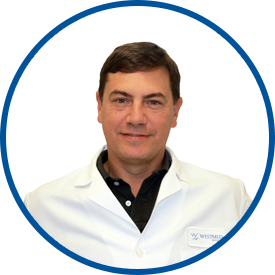 He was in private practice for 12 years with Lawrence Park Pediatrics until that practice joined Westmed Medical Group in January 2011. Love *Dr. Angello!! Patient, kind & laid back! *Dr. Angello does a great job each and every visit. any time we have to come to see doctor Angelo we always have a good experience. he knows our kids so well . I always recommend Dr.ngelo. He is very good at what he does. *Dr. Angelo has been extremely helpful during a very tragic death in our family. He has provided comfort and listened to any questions we had regarding this matter. Dr. Angello is the best. he always knows who we are and spends time talking to my son before getting down to the actual physical exam. His approach is great. Dr. Angello is the absolute best. He gives me the perfect amount of information each visit and he is spot on every single time as far as milestones and overall health of my child. We love *Dr. Angelo. He is relatable, friendly, professional and attentive. We love Dr. Angello. He listens, is kind, caring, and balances our check-ups with a bit of personal chatter to break the ice with the kids and get to know them better. Dr. Angello puts our children at ease and makes them laugh, all while providing the best possible care. He is really the best doctor. We never feel rushed and he takes the time to listen to any and all concerns we have. Each patient is an individual, not a number or an insurance claim and that is important! Dr. Angello is hands down the best pediatrician anyone could ask for. He is knowledgeable, concerned, friendly, professional, and great with children. He has empathy and always addresses the child's well-being holistically. He listens to parental concerns and truly cares for each and every one of his patients. *Dr. Angello is very caring and understanding. Great doc! I've always had a good experience at every single visit.